This stunning condominium residence is ideally situated on the water’s edge to offer spectacular lake views and will be home to a unique collection of spacious residences. Envisioned by internationally acclaimed Arquitectonica of New York City, this modern glass building has been ideally positioned to offer optimal water views from most suites and will be home to a collection of generously sized residences. AQUAVISTA will feature an outstanding array of amenities and recreational spaces, including a stunning infinity pool with sun deck and lounging areas. Energy efficient and environmentally focused by design, AQUAVISTA at Bayside will seek LEED® Platinum Certification – the highest rating possible within the LEED® Certification system. 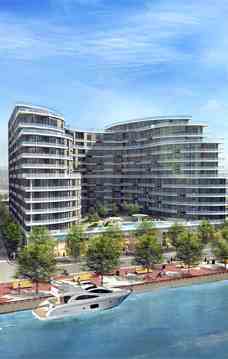 AQUALINA at Bayside is at the forefront as the first condominium residence in the Hines master planned Bayside Toronto Community. This vibrant community represents Waterfront Toronto’s single largest revitalization endeavour along the city’s inner harbour.